The 1970GX is the second model in the updated series (after the ambiguous 1970NX), so we shall not describe the new case in detail. I should only note that unlike NX, the 1970GX didn't lose its USB-hub on the way from the USA (that's where most innovations come from), which was a pleasant surprise. In other respects, the only difference of the 1970GX from the 1970NX is... the glossy display, which reminds of Sony HS94 and HS93. 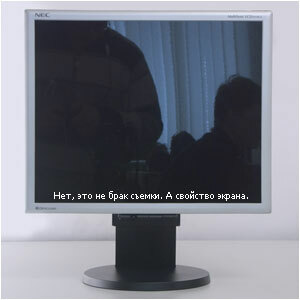 Indeed, for totally unknown reasons (it's a witticism, because the reasons are quite transparent — to increase brightness and saturation), this monitor is just another "desktop mirror". NEC has called this bright apparition OptiClear ("clean your optics?"). Unfortunately, the joystick responsiveness remains as low and inarticulate as in the 1970NX. According to the feedback from the first users, this behaviour may only deteriorate in time. So we should reproach the japanese engineers for the low-quality realization of a nice and practical idea. Let's hope that this problem will be eliminated in the next models (we are going to examine the latest 2070NX model soon). The convenient menu, praised in the previous tests, has not become any worse — it's still the same convenient and logical settings structure in the form of drop-down Windows menus, the same essentially convenient joystick, and the same annoyance from its low responsiveness. Dusty lustre! Speaking of the lustre: indeed, the glossy display in 1970GX impresses users with its fantastic capacity to reflect almost everything located in front of it. Besides, this happens almost in any lighting conditions. It feels really funny. But this disadvantage is balanced by the following advantage: the bundle includes a DVI-D cable, needed so badly in the 1970NX bundle! Controls Buttons and the screen menu or in the NaviSet program. Bundle user's manual and software on a CD, power cable, signal D-SUB cable and a power cable. NEC boldly claims (for the TN panel) 170° viewing angles, but it mentions the contrast drop to 5:1 (for example, the viewing angles of 1970NX, as in all S-IPS based monitors, are calculated at the 10:1 contrast drop minimum). The specified white spot brightness and contrast are very high (the black spot brightness must not exceed 0.6cd to obtain the specified contrast). 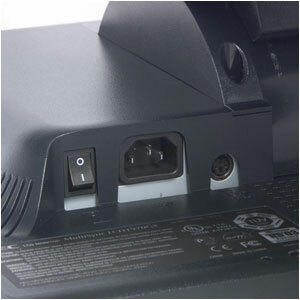 The built-in USB hub has no effect on the power consumption. Though we have already seen a similar problem with ViewSonic VP201, for example. The software CD traditionally includes an electronic version of documentation, drivers and NaviSet, which is easily integrated into Windows display settings panel and allows to configure your monitor without touching its menu buttons. Operating system: Windows XP Professional. The computer is based on Intel P4 2.4MHz CPU, 512MB of RAM, Adaptec SCSI-160 dual-channel controller with SCSI DVD-ROM Pioneer and 18GB 10kRPM hard disks. Video card: NVIDIA Geforce4 Ti-4400 with DVI and TV-IN. Audio: Microsoft Digital Sound System 80 (2.1) connected to Creative SB Live! 1024. 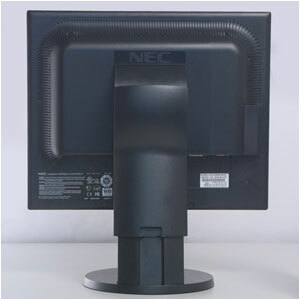 Calibrated 19" NEC MultiSync FP950 CRT monitor is installed next to the monitor under review to compare color rendition and response times. As usual, the monitor is installed as a regular "wheelhorse" and tested in usual applications. After we installed the monitor and ran it for an hour to warm up, it displayed a standard picture — it is impossible to fail to recognize TN+film. Even distinguished NEC experts failed to improve the image quality noticeably — the same whitish palette, the same horrible vertical viewing angles (the image is inverted when you look from below!). Add a mirror-like OptiClear display and you will get an idea of the 1970GX at first sight. At the second sight as well. No, TN+film must definitely stop at 17" diagonal, increased dimensions make the heavy genetic problems of this TFT panel type more prominent. But enough of abstract obstructions, let's have a look at the test background. We still use the same image — an auto rushing through the shady lane with bright turn-signals and a crimson identifying sports plaque. How are you doing, Mr. 1970GX? Alas, like a nothing. At the slightest movement of your head the hues change their vertical axis intensity, the red color looks pale, and the orange turn-signal gets obviously "lifeless". But the black background remains rather deep, and the white color has an evident red tint (which is to some extent even natural with the 6500K color temperature). The picture of the standard LCD HTML test also looks standard: Three extreme halftones (the darkest and the brightest) are indistinguishable, but you can try to make out the others. You will have to actively move your head though, trying to preserve the viewing angle relative to the normal. Let's check out the lighting — we'll remove the desktop photo, disable all elements, and leave only the black background. We'll also switch off the lights in the test lab for precision's sake. Now it's only the 1970GX and our eyes in the dark. And these eyes can see some lighting when taking a side view; but nothing critical, no prominent hues. In this case you will not see that deep black color (low luminance), which blesses PVA panels, or the violet hue like in S-IPS panels. And one more thing, there is no reflection in the glossy display for the first time since we started the tests. This reflection is very irritating and really incommode. Our constant readers know that at this stage we use monitors under review for regular office work — we do DTP, reading, and typing, we prepare presentations and work with graphics. How good is the 1970GX, intended as a multimedia monitor, at these commonplace applications? It actually qualifies for this work, but not very well. Letters immediately become unreadable at fast scrolling (where are you, the mythic 8ms response time? ), Flash and PowerPoint presentations with video fragments get blurred, and contrasty elements get ghosted in case of the analog connection. Here goes a present to Narcissi — your constant reflection, and a good outlook of what's behind you — it's like a rear view mirror in a car! We had to enable smooth scrolling in Internet Explorer to visit such sites as forum.ixbt.com. The green striped newsru.com background on the right vibrates and twitches at scrolling. And the general white background is too reddish. The resulting conclusion is simple — the manufacturer was right with the 1970GX positioning — not for work. Desperado The main scenery is dark (old America: bars, houses), there are some dynamic scenes with shooting and fighting. Superbit version of the high quality (the level of rare original discs). StarWars The Fantom Menace (Episode I) Combination of computer animation and regular movie. Very dynamic episode with chases, bright backgrounds. Original disc. DVD-version of the "Gorky Park" TV concert, TV clips. Average TV quality, high compression - small stream. It reflects the quality of most "black market" discs. Original disc. Paul McCartney's concert Average quality, many completely changing scenes (conservatory hall). Original disc. We use NVIDIA PowerDVD 6 in full screen mode to watch DVDs. Let's do justice to the 1970GX — this monitor masks successfully almost all the noise (aka image losses from heavy compression and bad video source) both on the concert DVD "Gorki Park" (but sometimes you want to make out the features of musicians) and at Sir Paul's concert. The latter is characterized by violet spots, which stand out on fast panels when the hall view is changed. But everything is OK on the 1970GX. It's nearly impossible to make out individual heads of the audience though — everything is blurred to a mist. We have been trying hard for a long time to find a monitor that would not cope with Star Wars. But our quest has not been successful. Monitors come and go, but this Episode looks as good as ever. That's what low-resolution computer rendering and low detailing can do! The 1970GX has not become the "negative pioneer", the dynamic canyon race scene looks a tad blurred, which is a standard thing for TN+film. The last DVD with charismatic Banderas has become a stumbling block for NEC: you may lose the thread of events in the dark scene of a fire-fight in the bar — the slow response time of the panel will make you guess the on-screen events rather then get involved into the action. In these movie fragments you will miss the fast switching speed between dark halftones. But as soon as the camera comes out to sunlight of the old town — all complaints about the 1970GX stop and the image looks like on a good CRT TV-set. We traditionally use Return to Castle Wolfenstein, Episode 2 (outdoor scenes and small closed spaces), for the gaming test. All video settings - to maximum. I'd like to say a few words about the express-method of the panel response time, the one that every game test starts with. What do we do at the specified game scene? We start in the first scene of the level, in a small cellar with a sliding wall covered by a bookcase, where you can spin around fast and evaluate how much details the books and wall textures will lose. After that, while our guide is telling us about the enemies and wishes us good luck, we can run the stairs into a room and run around a table with steaming food. It's done to evaluate the reality effect by the sharpness of surrounding walls. Then we return down to the cellar. The wall has already slid aside and we can now go to a wine cellar through a corridor and a trap-door. In the cellar, we can run fast between the columns (it's desirable not to alert the drunk soldier so far) in order to take a closer look at the sharpness of the environment again. Then we destroy the enemy and run the stairs to the large hall. The 1970GX manages to render completely changing views rather well, but it's still a long way to the crystal sharpness. An officer and a soldier are waiting for us, so what we do is just run straight forward, shooting at the officer (hidden behind the openwork partition), then rapidly turn 180 degrees and eliminate the soldier, who has just run out behind your back. It's clear that the slower the panel is, the harder it is to coordinate your actions (roughly speaking: to get minimum damage and to spend minimum cartridges). What concerns the 1970GX, it's rather comfortable to move and shoot, though the panel response time could have been better. Then we can stay inside, in front of the door, and start strafing left and right to see how the panel copes with rendering the arc — whether the outline tail is long. The 1970GX offers an adequate picture here (if you remember, PVA-GT from BenQ showed strange violet-green shadows in this test), it's close to the 1970NX. Then our test extends to the open space, where we methodologically exterminate enemies (running in the yard in circles, evaluating the coordination of movements and the firing accuracy). When it's all over, we approach any corner and walk to the center of the yard, looking up at the tree crown. Fast panels (like S-IPS 16ms) allow to make out the foliage in motion, while slow panels (especially MVA) turn the crown into a blurred ball. If you stop abruptly (preferably, if you stop from running), you can see how the foliage suddenly gets sharp (as if a near-sighted person puts on his glasses). Leaves are shown blurred on the 1970GX in motion, but the blur level is moderate, which helps not to lose your hold on reality of the game. And the last thing, we stop at 5-8 steps from any wall, face it, and then strafe making periodic stops too evaluate how the textures are blurred in motion. This test is especially effective, if you install a secondary CRT monitor and enable Dual-View mode. Such hardware configuration easily shocks all I-don't-see-any-blur-on-my-50ms-PVA fans — even the fastest LCD strongly blurs details in motion. The 1970GX did not escape the common lot. However, if we don't want to be too harsh on NEC, we should admit that its positioning as a game platform is quite acceptable. Most gamers will actually be happy with its performance in active games — it's a good omen for TN+film fans. 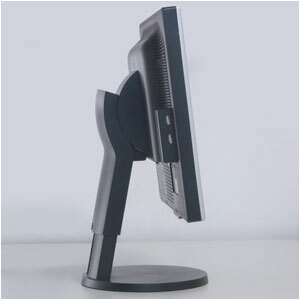 However, one "but" remains: you'll have to sit straight in front of the monitor, positioning the display surface to the normal. Otherwise, if you move your head up and down, your eyes will be disappointed by the sharp changes of hues, right up to the inversion. Alas, angles of view in a TN+film panel are still a disaster, especially at large diagonals. If NEC engineers had somehow solved the problem with viewing angles, the 1970GX could have reinforced the cohort of outstanding monitors. However, the realia do not allow to palter with truth — this model does not look like a definite winner for multimedia fans. We have already got a certain impression of the 1970GX, however hardware tests may turn out quite ambiguous sometimes. Is it one of such cases? As we already know the peculiarity of TN+film panels to demonstrate the claimed response times only at maximum brightness, we took the readings at reduced brightness as well as at reduced contrast. We did the right thing: while at 100% brightness it really demonstrates a slightly more than 16ms response time at the standard (for ISO) 0-100-0% white luminance transition, slightly decreased brightness throws the pixel switch-on time back by 5 points to 21 ms! On the other hand, the light-struck black color gets noticeably better at reduced brightness. So it's up to you to decide what's more important: speed (for example, when proofreading texts) or deeper black color (to work with photos). But where are 8ms? Interestingly, when pixels switch on to 50% brightness (127.127.127 — a standard color for Windows menus and dialogs), the response time drops twofold, down to almost 33ms. And the monitor brightness settings have almost no effect - the total difference does not reach a single ms. But the brightness setting has considerable effect on the gray-to-white transition (50-100% brightness), which is on a par with the black-gray mode — nearly 8ms for the switch-on cycle! In this case you will already see the difference with the naked eye — 32ms and 40ms in games is a large difference. When we tested the halftone-to-halftone transition (30-70-30% of white luminance), we found out an anomaly — the reduction of brightness resulted in the drop of switch-off time by those very 7-8ms, which were in excess in the previous test. In this case, a reduction of monitor brightness resulted in a very good response time of 36-37ms, which has a great effect on the monitor responsiveness in games. If you compare these figures with the parameters of the 1970NX, formally based on a 25ms S-IPS panel, you will see that... on the whole, both monitors are on a par in their performance. Well, well, well... the latest super-gaming monitor based on the super fast 8ms panel hardly catches up with the performance of the old S-IPS panel, which has been used in many models for over a year. Don't forget that 20" models from NEC and other manufacturers have been using 16ms S-IPS panels for a long time, and they are far beyond the reach of TN+film. How is that shock to you? Yep, TN+film vendors think that 8 = 25. It's an amazing Chinese mathematics that really helps to swindle customers. It seems high time to bring this case before a court. Concerning the color rendering, the 1970GX demonstrates too much brightness in the red channel, the blue and green channels are only slightly above the standard. Interestingly, the situation with NX model was different — it demonstrated significant increase in blue brightness in sRGB/6500K mode. The 1970GX is also short of some candelas in brightness — about 25%, having demonstrated 307 instead of 400 claimed in the specifications. What concerns the contrast ratio, the things are really bad — only 365:1 instead of 700 (where have you seen 700 in a TN+film panel? Somewhere near the 8ms). Remember that the standard is 6500. The temperature is evidently shifted and definitely requires to be corrected. NEC 1970GX has just confirmed that even the brilliant japanese minds cannot make a good product out of TN+film. But the question is: if this panel type has always been one of the cheapest, why is NEC 1970NX with a more advanced S-IPS panel cheaper? Just to be able to look at your reflection in a mirror of the display? We'll leave this conundrum to you. If you need a DVI cable or you suffer from narcissism, this model is for you. Otherwise, you'd better have a closer look at the 1970NX.